Today we feature debut author Chana Stiefel, whose book, DADDY DEPOT illustrated by Andy Snair (Feiwel & Friends) is coming out on May 16th. Be sure to enter to win a copy of the book at the end of this interview! I have always loved picture books and have great memories of my mom reading me classics like Robert McCloskey’s BLUEBERRIES FOR SAL. (My mom had a Chicago accent so we used to think the title was BLUEBERRIES FOR SALE.) A bunch of years later, after majoring in English in college, I earned a Master’s in science journalism from NYU. I interned at Scholastic, which was down the block from the J-school, and I became hooked on writing for kids. I started out as an editor at Scholastic’s Science World magazine and later wrote more than 20 non-fiction books about science and history for the educational market. Over the years, I read thousands of picture books to my four kids. It took me about 15 years to realize that my true dream was to write my own picture books. I joined SCBWI, attended conferences & workshops, read every blog and book I could find on writing picture books, wrote and rewrote draft after draft with feedback from my critique partners, learned the querying process, signed with my agent…and BOOM, just like that, my first picture book is coming out! Congrats on your debut picture book, DADDY DEPOT! Tell us about the story and what inspired you. Thank you so much! It’s been a journey, but well worth the effort. When my kids were little, we would often make up silly stories at bedtime. One night my daughter Maya (then 7) was mad at her dad for reasons I can’t remember. We made up a story about a little girl who returns her dad to the daddy store. Afterward, I ran downstairs and started writing…and eight years later my debut picture book is out in the world! So basically I owe this one to Maya and her short fuse. You've written several other books. Has your journey to publication been long and winding, short and sweet, or something in between? I’d say it’s been long, winding, and super sweet. After I wrote my first draft of DADDY DEPOT, I decided to attend a Sunday workshop with NJSCBWI in Princeton. During the entire two-hour drive, I sang out loud (to myself), “I’m gonna get published…” Well, that draft got totally slammed. Basically, it was too long (about 1,000 words), had no main character, no real conflict, no arc, and it rhymed…badly. I learned that I knew nothing about picture book writing. I shoved my draft in a drawer and tried to forget about it. Then, about six months later, I got an email from Writer’s Digest about a picture book webinar by editor Mary Kole. That webinar turned my career around. I still have my notes! I did a total rewrite and my book started to take shape. I must have written 100 drafts but the process taught me the ropes of picture book writing. Lots! I’m writing a book about creepy critters for National Geographic Kids. I pitched that book as a proposal to an editor at the 21st Century Children’s Nonfiction Conference in 2014. (I proposed it as six short books. Now it’s one big book.) While the approval process took a long time, it’s been a lot of fun to write. The photos will be outrageous. I can’t wait to see this book come out in Fall 2018. I’m also revising a picture book biography and working on a few other manuscripts. Hmmm, the easiest part is…ummm…nothing about this process is “easy” for me but I will say it’s lots of fun and very gratifying when you hit the “send” button on a polished manuscript and blow it a kiss. The hardest part right now is finding time to write. I recently started a new part-time job after working from home for many years. I love my new workplace (I’m the Director of PR at an all-girls high school), but I miss writing full time. In addition to my writing days, I’ve been writing at night, on weekends, and on line in the supermarket. I think my family is ready to return me to the Mommy Market. Never give up. This field is filled with rejection. But if writing picture books is your dream, learn from your mistakes and keep going. The kidlit community is here to help! Join SCBWI, attend conferences, participate in online challenges like Storystorm, ReFoReMo and 12 x 12, and write on! When I was a kid, my father and I climbed up to the roof of our house and poured paint onto a giant canvas on the ground just to see what would happen. It didn’t go well (we splattered the side of the house and my mom was steamed), but that was probably the beginning of my creative life. Check out my work at chanastiefel.com. 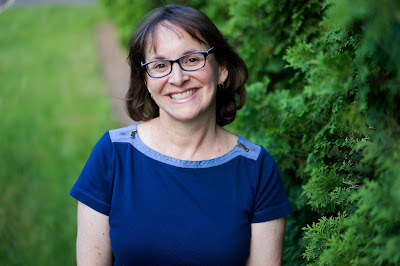 I co-blog “bite-size bits of wisdom for writers on the go” with my writing partner Donna Cangelosi at kidlittakeaways.com. You can also find me on Facebook and Twitter @chanastiefel. Chana Stiefel is the author of more than 20 non-fiction books for kids about stinky castles, exploding volcanoes, and other wild stuff. 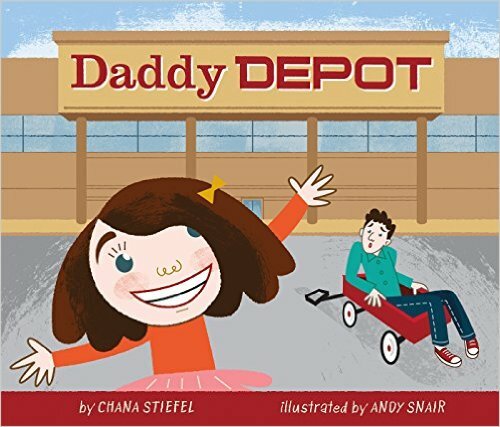 DADDY DEPOT (illustrated by Andy Snair, Feiwel & Friends, 2017) is her debut picture book. Chana is writing a book about creepy critters for National Geographic Kids (Fall 2018). WAKAWAKALOCH, a semi-autobiographical picture book about a cave girl who wants to change her unpronounceable name, will be coming out from Houghton Mifflin Harcourt in 2019. More great news coming soon! Loved this interview. My fav bit was about your painterly introduction to creativity! Thanks for sharing your journey Chana. I look forward to buying your book. Thank, Chana. I love hearing about your journey and all of the hard work you put into your books. Congratulations. This is such a great post. I love how you encourage other writers not to give up but also are honest about the hard work it takes. I can't wait to read this book! Aww, congrats Chana. So happy to finally see this book in print. I know it will be a favorite. Wow what a creative journey.,,and it's still in the making!! Thanks for sharing! I also love the part about the painting of the canvas with your very cool Dad!! 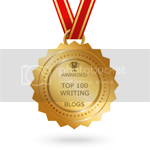 Best of luck in your writing endeavors! Thanks for sharing your story, Chana! The long winding parts and your inspiration for Daddy Depot. Can't wait to read this book! With a cover like that, I'm wondering, how did they get like that? What is going on here? What happens next? Such a great book idea-congrats and thanks for this post! I can't imagine Daddy Depot as a bad draft - it was a great concept & well-written when I first saw it many moons ago at NJ SCBWI. Can't wait to read the published version! Congrats, Chana! So happy for you, Chana! This book looks amazing! 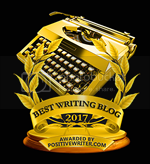 Thanks for the encouraging words - write when you can, keep on at it! Congratulations! Congrats on your debut picture book, Chana! It sounds like a fun premise. Congratulations on your book! It sounds super cute and I can't wait to read it.